In response to what has become known as the financial crisis of 2008, the central bankers of the world have employed nearly every form of monetary alchemy at their disposal in a desperate attempt to maintain the status quo. The status quo, which in this case means that all commercial banks and sovereign governments remain both liquid and solvent, has become increasingly difficult to maintain, as each attempt to stimulate economic growth via ultra-low discount rates and quantitative easing has seen a diminishing marginal return in terms of economic growth. The longer the central banks of the world engage in these and other forms of financial alchemy, which in the end serve as futile attempts to defy immutable natural laws, the greater the danger of a complete economic collapse becomes. The unconventional measures employed by the central bankers of the world over the past five years are not only failing to achieve their stated goals of increasing employment and economic growth; they are triggering what is quickly becoming an unmitigated disaster in fixed-income markets. These markets, once the bedrock of global finance, have now been conditioned, in the Pavlovian sense, to do nothing more than attempt to front run the actions of the Federal Reserve and other central banks up and down the yield curve. As the chaos continues to unfold, it is important to examine and understand how humanity has arrived at this critical juncture in history. 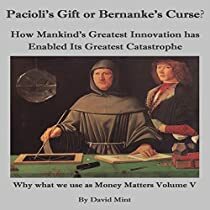 It is the aim of this volume to answer this question by exploring two of the oft-overlooked elements that have, each in its own way, given rise to the system that enables a relatively small group of persons the ability to destroy the accumulated wealth of mankind’s 9,000 years of toil in just over 100. These elements are commonly known as dual-entry accounting, which we refer to as mankind’s greatest invention, and central banking, which we refer to as mankind’s greatest catastrophe.